Alcohol Awareness Week, October 1996. Auburn lit 2,210 candles in memory of those who had / would die that month in alcohol-related accidents. They put a demolished car on the Haley Center concourse to drive home the importance of having a designated driver. And at the end of the football season, they bragged about stealing your liquor. And then literally poured it down the drain. 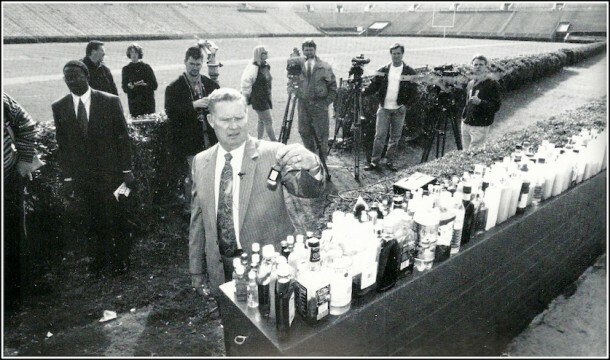 Police Chief Bill Nevin held a press conference following the 1996 football season in order to display the amount of alcohol confiscated at football games. The alcohol was taken up when any student, alumni or fan tried to enter the stadium with it. Alcohol was prohibited from Jordan-Hare Stadium in the 80s after a student from the University of Georgia was injured by a bottle. Many people found creative ways to bring alcohol into the stadium, from taping it to their legs to hiding it in stadium seats. 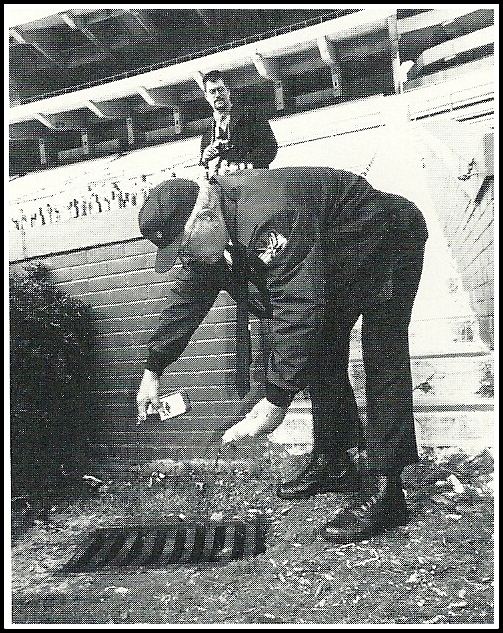 More than 115 liters of alcohol were literally poured down the drain in a effort to raise awareness of this issue. To be fair, Auburn fans probably needed their nerves steadied a good bit that season—smoke monsters, a 4 OT loss in the Deep South’s oldest rivalry. Of course, if the legend of the “AU Underground” is true, surely there were some enterprising teenage Auburn ninja booze hounds down there reclaiming their hooch with flasks held high à la Dennis Quaid in Innerspace. We’d like to think so, at least. I admit that I am a older grad. When we went to a game with my daughter in the 90’s I was so impressed that all the young ladies had on nice dresses until i went in the ladies room and so that the reason they had on dresses was that they had flasks tapped to their inner thighs! The car on the concourse didn’t last long. Students started removing parts for “recycling” purposes. It seems like someone got arrested for it.